Why would anyone in their right mind head for baseball territory in the off season? because my boss is making me go. I will be in Phoenix this week at a conference that has to with my job and not my hobby... I am hoping to sneak away for a bit and at least snag a few pics of the stadium, plus get away to get a few pics of the Tribe's new Spring traniing facility. I'll let you know how it goes! How could have I forgotten!?! My deepest apologies to Joe. I forgot to mention that included with my Tribe cards was this unopened piece of gum. I am going on the assumption that it came from the pack he ripped on the way to post office. If not, well, should my blogging suddenly cease, you'll know why. It's been a crazy week for me, as it has for most folks I would imagine. Well, earlier this week (I don't remember when, but I think it must have been Monday, maybe), my wife came in and handed me several packages from the mail. 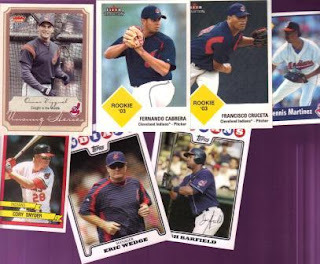 Each package had some of my favorite things: Tribe Cards!! Wahoo! Thank you so much, ladies!! Great stuff! Thanks a bunch, CB!! Way to go, Joe!! Thanks! Thank you so much, PunkRockPaint! What a great way to start off Thanksgiving!! Now, it's off to watch the parades!! "12 Days" List is g-r-o-w-i-n-g! Wow! I've got a lot of fun ahead of me! There have been 21 people request gift packs so far, and hopefully more to come! If you're holding back out of fears that I might not have enough cards to go around, you can put those fears aside! 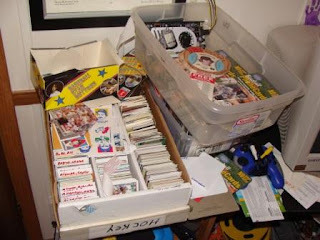 I've recently acquired a TON of cards (have to sort them still), so I should have no problems fulfilling requests! On that note, are there any A's fans that would like a gift pack?? How about Pirates fans? Maybe Reds? Blue Jays? Mariners?? Or for that matter, if you're a fan of ANY team and want a free stack of team-related items, feel free to ask! Wait a minute! Did I just say "items!?" Yeap. This year's "12 Days" is not just limited to cards! I have all kinds of doo-dads that will be included with many of the team and/or player gift packs! Some of you may be worried that you'll get the same things you got last year. I really doubt that would happen, just because my 'trade fodder' has changed out at least a couple times during the year for many teams/players (or has severely grown since last year for others). I don't think I spelled this out in the original "12 Days #2" post, but these will all go out starting around December 10th. Remember, the cut-off date for requests is December 20th. Thanks to everyone that's reading along (whether you ask for a gift pack or not)!! I really appreciate all the comments, personal notes, and each of you that hangs out in the background, just checking things out! I've been having a LOT of fun with the blog and I am hoping the Good Lord keeps me around for a long time to continue doing it!! I am very thankful for everyone that brings their browser by here or subscribes in their feed reader. I hope y'all have a VERY Happy Thanksgiving! Johngy and ChrisM Spreadin' the cheer! The cards above are all from the Traded or Tiffany Traded variety. As I mentioned before, I did not understand the difference until relatively recently, so my inventory of traded and Tiffany are a bit out of whack. These definitely filled holes in my collection! In fact, if memory serves, out of all the cards he sent, less than a handful were cards I already had. In his defense, however, I noticed that some of those were in my 'to be filed' box (meaning I had only recently acquired them). Talk about your holiday spirit!! I'll have to work extra to try and even come close to matching it! And then to my wondering eyes did appear, but another package of holiday cheer! I read the return label, and ChrisM's what is says. Inside the envelope were TWO Victor Martinez! Chris sent me a 2007 UD Masterpieces Captured on Canvas and a 2008 UD Masterpieces! I don't know about the rest of the card-collecting bloggers out there, but when the artwork on the Masterpiece cards is done right, it looks fantastic. Quite like little painted treasures. I also like the 'raised border' effect, like the cards are framed. These are great additions to my Tribe collection! Thank you Johngy and ChrisM for a wonderful surprise after a hard day's work! You'll have something extra in your stocking this year, for sure!! Don't forget, readers, the 2nd Annual "12 Days Giveaway" is happening now! 2nd Annual "12 Days Giveaway!" Last year's "12 Days of Christmas" giveaway was a huge success! It all started with an idea born from one of dayf's posts and then went wild from there. 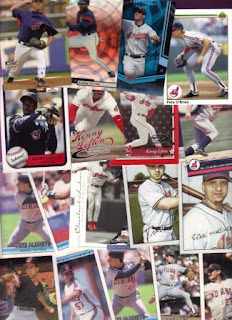 The whole thing was a great adventure that served to accomplish several things: First, it helped get folks in the holiday spirit; second, it helped collectors get more cards in their hands; and, third, it helped clear out a LARGE chunk of cards I had laying around! 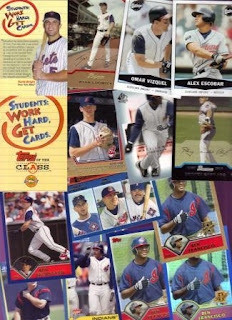 Last year's giveaway consisted of football, basketball, and baseball cards. 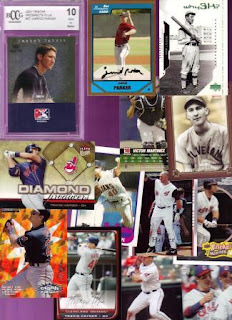 This year will mostly be filled with baseball cards, though I do have some football and basketball I will try to get in there as well (depending on responses, etc). ANYONE can request a gift pack! Send me an email (from my profile) with the subject "12 Days Giveaway;"
Gift packs may be requested to be sent to someone else on your behalf, but those will take second priority over folks asking for themselves. I cannot promise that '2nd party' gifts will be fulfilled. I will let anyone who requests one of these know the fulfillment status as we get closer to the cut-off date. All requests should be sent to me before December 20, 2008. This gives me time to assemble the gift packs and get them mailed off in time for Christmas (hopefully!). I have several packages going out as part of other trades. These do not count in the 12 Days Giveaway! The 78 cards will be chosen in the fashion of the song, "The 12 Days of Christmas." So, each gift consists of 12 similar cards, 11 similar cards, etc until we get to the 1st day of Christmas! 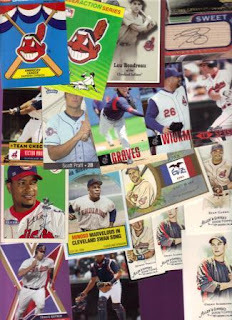 So, let's say someone requests Indians... That person might get 12 Jim Thome, 11 Sandy Alomar, 10 Bob Feller ... down to 1 Game-Used Jersey... (just an example, who knows what will actually end up in the gift pack!!). You can get an idea of what last year's was like by checking this link. So, let's get in the holiday spirit! Yes, I know it's not quite Thanksgiving yet, but if the stores can bust out the holiday decorations, I can start busting out "12 Days Giveaways!!" It has been a LONG time since I posted a Uniform post, so today I spent some time to walk through the next group of Number Eleven-wearing Tribers! Enjoy! 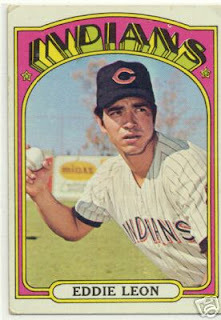 Eddie Leon - 5 seasons (1968-72) - Leon only wore the Number 11 during his final season as an Indians player. Before that, he wore Number 24, so we'll see him again later. In '72, he had 225 at-bats in 89 games. He had 45 hits, 2 doubles, 1 triple, and knocked in 4 homers, all of which netted him 14 runs and 16 RBIs. He was traded to the White Sox in 1972 for Walt Williams after accumulating only a .200 average on the season. Frankie Hayes - 2 seasons (1945-46) - Hayes may have left the Tribe with a .246 overall average, but in his two seasons, he got on the All-Star team in one of those (1946). And the other season didn't have an all-star game (1945). Not too shabby. 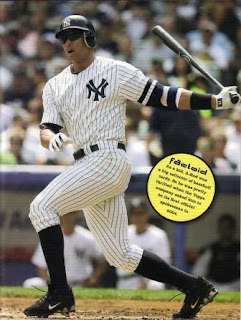 Overall, he had 541 at-bats in 170 games with 131 hits, 27 doubles, 6 triples and 9 home runs. He brought in 61 RBIs and walked 74 times while striking out 78 times. 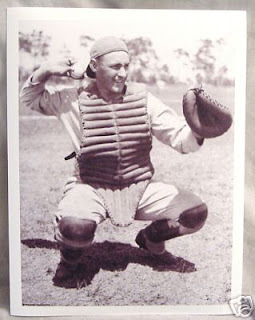 Hayes served as catcher to Bob Feller in the post-war all-star game. Now, that's not a bad gig at all. Frankie Pytlak - 9 seasons (1932-40) - We took a look at Pytlak a few uniform numbers ago when he sported the Number 8. That was the 2nd half of his Tribe career. 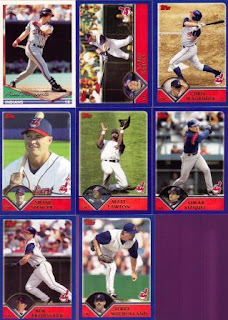 During the first part of his years with the Indians, he wore the Number 11. During those first five seasons, he racked up a respectable .285 average. He had two .300+ seasons and another in which he batted .295. He made 939 plate appearances in 313 games while wearing Number 11. He scored 136 runs with 275 hits, 44 doubles, 16 triples. Incredibly, he only had 3 home runs. As a side note, in his entire twelve-year MLB career, he played in 700 games. He was a catcher in 699 of those. Only in one game in 1940 did he get moved to right field. I don't know how he fared at the plate during that game, but his fielding percentage as a goose-egg... Based on his stats, he never had a play oon the ball. Weird. 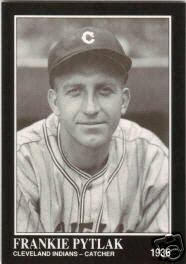 Hank Ruszkowski - 3 seasons (1944-45,47) - Ruszkowski was born in Cleveland, grew up in Cleveland, played for the Indians three seasons and just over 50 years later died and is buried in Cleveland. A true Triber in every sense. he played while most of the other players were off at war. During his three-year stint, he had 84 at-bats in 40 games. He hit three home runs in his career with 2 doubles, 20 hits and scored 8 runs with 10 RBIs. He left the majors with a .238 average. Herb Conyers - 1 season (1950) - Conyers played in only seven games during his career. In those seven games, he scored 2 runs, had 3 hits, and hit a homer. He struck out twice and was walked once. He ended his career batting a .333 average. He died a short 16 years later. 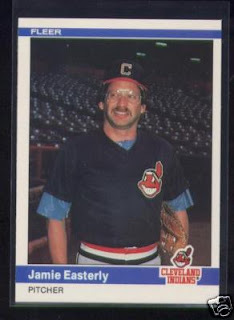 Jamie Easterly - 5 seasons (1983-87) - Easterly only wore Number 11 for a portion of his last season in the majors. We'll meet up with him again later. Since his final season is split, we'll go ahead and talk about the whole 1987 stat log. We went 1-1 with a 4.55 ERA in 31.2 innings pitched. He gave up 26 hits, 16 earned runs, 17 runs and 4 homers. He also struck out 22 batters and walked 13. 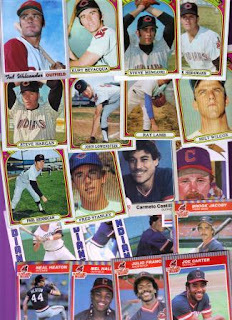 He had suffered injury off and on during his time with the Tribe and at the end of '87, he was let go. Jeff Branson - 2 seasons (1997-98) - Branson came to the Tribe in a 2-for-4 player swap with the Reds. 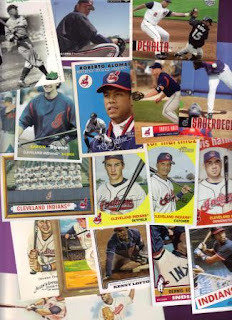 He served as the utility infielder during his days in an Indians uniform. He was lucky enough to have joined the Tribe the same year they went to the World Series against the Marlins. He had one at-bat as a pinch hitter in the series, which unfortunately resulted in a strikeout. He left Cleveland for free agency in 1999 with a .232 batting average overall. While making his 172 plate showings, he scored 11 runs, 39 hits, 8 doubles, 1 triple and 3 home runs. He also struck out 38 times, making just as likely to strike out as to get a hit. 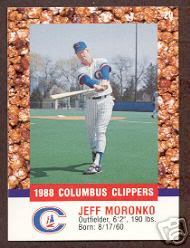 Jeff Moronko - 1 season (1984) - I don't believe I'd ever heard of Moronko before the countdown. He batted in only 7 games in '84, though he made 19 appearances. He struck out 5 times and walked three. He had 3 hits, scored 1 run, had a double, and brought in 3 RBIs. He left with a .158 batting average to return to the minors for a few years before the Yankees picked him up (in '87) for only seven more games. 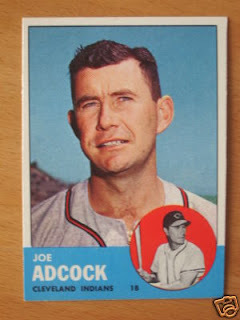 Joe Adcock - 1 season (1963) - It surprised me to discover that Adcock only played one season with the Indians because I know I have several of his baseball cards for the Tribe. The reason? 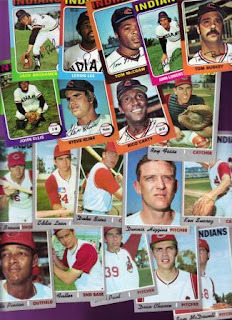 well, after playing in '63, then a few years for the Angels, he came back to the Tribe in '67 to manage them for a season. As for his playing time in Cleveland, he had 71 hits, 28 runs, 7 doubles, 1 triple, and 13 home runs. He had 49 RBIs and struck out 53 times. He left the Tribe with a .251 batting average. Heeeere's Jhonny! No, really... It's not a Halloween card. Really. As many of you know from reading his blog, Thorzul held his 2nd "Trade Me Anything" giveaway recently. Well, okay, I believe it is actually still going on. I contacted him about a trade and he had no Indians in the current offering, but allowed me to participate in a Tangential Trade (alliterative - yes, easy to spell or say - no). So, I sent him some Brewers (a couple I think he ended up needing!) and he sent me S-H-I-N-Y cards!! 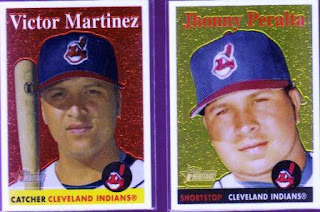 Here is a 2007 Topps Heritage Chrome/Shiny/Insert of Victor Martinez and one of Jhonny Peralta. They are both serially numbered!! Martinez is 1864/1958 and Peralta is 0521/1958. I laughed out loud when I saw the shiny Peralta card that my Halloween entry was based on! I bet Thorzul had a good laugh at that himself. Thanks a bunch!! This was a GREAT trade in my book! In 1864 (Martinez's serial #), the submarine Hunley becomes the first sub to sink an enemy ship; Congress passes the law requiring "In God We Trust" to be inscribed on coins; the American Civil War is raging; and Abraham Lincoln gets reelected. In 521 (Peralta's serial #), Future Byzantine emperor Justinian becomes consul; Boëthius introduces Greek musical letter notation to the West; and the number 521 is a "Lucas Number." To answer Billy's question: I have dual nVidia GeForce 8600GT's with 256 MB on each operating in SLI mode. :-) The card in the picture also happens to be an 8600GT that I received as part of nVidia's insane Lifetime Warranty program. The original card was a 7600, or maybe a 7200 that had gone bad. I sent the card in (after contacting nVidia) and they swapped it out for the 8600GT! Talk about a deal! I think it only cost me shipping one way, too! Organization is the worst part of collecting. Frankly, I hate it. That also explains why it sometimes only takes place after the cards are spilling everywhere. It's dry and tedious placing the cards in the right places in the binders. Oh, man, I forgot... Yes, the cards are grouped together by brand then type inside the binders. It is not as organized as it sounds. 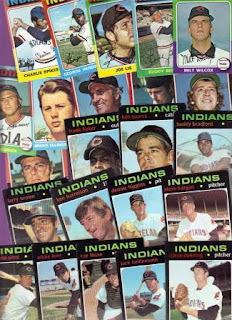 They all start off with Topps base set for that year, then from there it's a free-for-all. 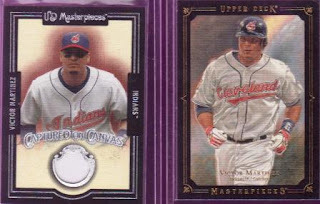 Upper Deck MVP might be next, followed by Fleer Flair, followed by Topps Heritage (all for the same year, though, remember). 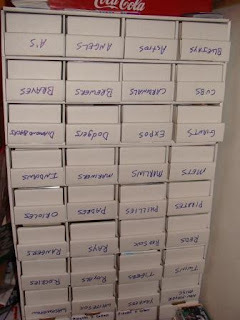 I have considered on many occasions putting the cards in some kind of order inside the binders. But, really, do I need that much organization in my life? I don't think so. The "Balladeer of Baseball," Terry Cashman, wrote the "Ballard of Herb Score" in 1996 after meeting Herb Score. I had never heard the song before, but Indians.com has a link to the song (you can click here to hear it). And if that doesn't work, visit (this page) and follow the link to the song. 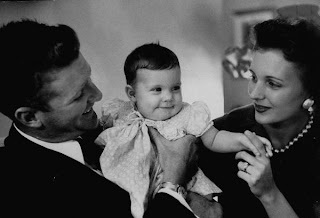 The more time that has passed since Herb Score's passing, the more his life and career has weighed on my mind and heart. I know a LOT has been said and written about him, his career, his passing, and I was able to scribble down a quick post while at work that day. Score was not a player I followed much as a collector - for whatever reason. Sure, I've got several of his cards and I'll be delving into his career more as I continue the countdown, but I guess I just never knew that much about him. I never listened to the Indians on the radio (wasn't anywhere I could for the most part), so I never heard his broadcasting. Though, I do remember him vaguely from the 1996/97 seasons for some reason. Blog Bat Around: No Tribial Matter! I've been wanting to post something about my collection for a while now, but couldn't figure out how I wanted to frame the post. Thanks to Sports Cards Uncensored's Bat Around, I at least have the skeleton. We'll see where it goes from there! 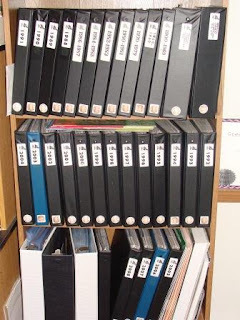 What you see above are the binders that hold 99% of my Indians collection. Why only 99%? Well, you see, as a team collector, I have several items that are too big for binders. I also have items that I am waiting for a shipment of pocket pages in which to place them. Some are long and skinny, some are tiny, some just don't fit any type of standard whatsoever. This may seem all well and good, but as the years have gone by, my team collecting has become a double-edged sword for sure. 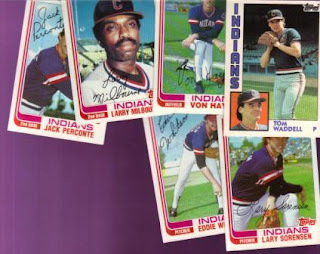 My original (and quite lofty) goal was to have a complete set of every Indians card ever produced. I would still love to achieve that to the degree which I am able. 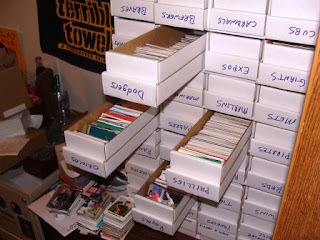 But, you see, with all the short prints, 1/1's, and heaven forbid Topps Tek, out there, I don't know that it is actually a reachable goal within the limits of my finances. So, I relaxed my standards (which inversely INCREASED the enjoyability) to say that my ultimate goal is to have at least one type-card ever made. And, as a bonus, the more non-duplicated Tribers I accumulate will be the icing on the cake. I don't know about you, but I am an icing fanatic - the more the better! I've not yet breached the $200-for-a-single-card yet. This means I have some very rare and valuable cards missing from my collection. 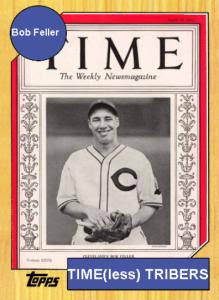 But, it also means that I am willing to take a faded, rounded, creased original Nap Lajoie, Cy Young, Bob Feller, or any other Triber, any day of the week! I am a TEAM collector, not a MINT TEAM collector. 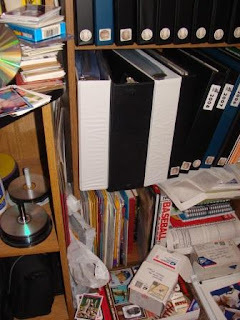 As many of my readers and traders know, I am also a very enthusiastic collector. 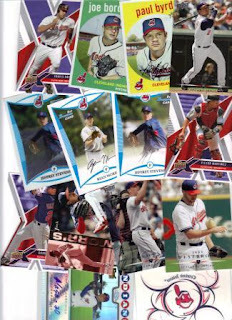 I am just as excited to get a stack of Tribe cards that all end up in my duplicate box as I am in receiving a stack of cards that help knock items off my 'do not own yet' list! I admit, I do get a bit on the giddy side when I get cards I need because it means I have not seen those ones before. 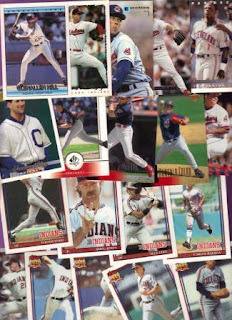 But, the cards I receive that I already have are usually cards I haven't seen in quite a while, so I relive Indians history through the cards I hold in my hands. And that's good enough for me. 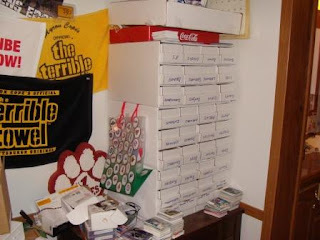 Some time ago, NightOwlCards posted an entry in which he won various prizes for knowing the year of a bunch of cards that had been thrown into (and subsequently saved from) a dumpster. Are you with me? If not, read about here. 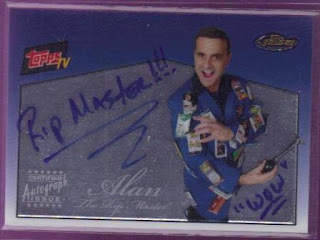 Well, in my infinite wisdom, I mentioned that I could use the "Rip Master" auto'd card in a future contest. I also may have mentioned that the jersey cards would also come in handy. Well, I hit the veritable jackpot! The only thing missing from the package sent to me by NightOwl was the leg lamp and the word "FRAGILE" (it's Italian) on the envelope. Jorge Velandia, Victor Martinez, and Shin-soo Choo are the first three in the penny sleeve. Velandia played in 7 games last year and netted himself a .375 average. He probably wishes he was still on the Rays as far as 'winning seasons' go, though. I'm not sure what the 'god-light' is trying to say on Vic's Masterpiece card. I think there is a hidden message in there. Choo's got a cool action shot, but if you look closely, his eyes are no where near looking at the ball. I'm a little confused by the whole thing. 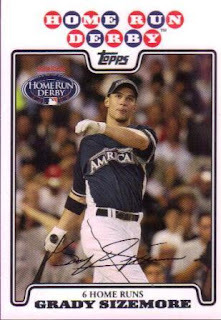 This one comes from the Home Run Derby portion of 2008 Topps U&H. He appears very Jordan-esque with his tongue providing the needed lift on the ball he just sent packing. I actually like the little State Farm HR Derby logo on the card. It's unobtrusive and adds a neat feature. Okay, the truth is, I have no idea who this guy is. I don't watch ToppsTV (it is an online thing?). But when I saw a guy decked out in packs of cards, well, I figured I would ask to have it for a contest. I was actually surprised to get it, given the semi-known outcome for it... The back says, "Voted one of sports collectibles industry's most influential people of the last 20 years." Exactly how many people are on that list, anyway? Was Ben Henry, dayf, Mario or Patricia up for that award/nomination? Were sites like SCU, Stale Gum, or Thorzul Will Rule included? How about the dozens of other bloggers with sites (many of which are listed on the right, but a vast majority can be found on the baseball blog list blog) that have given Beckett and other 'top dogs' a run for their money? Was NightOwlCards ever given a fair shake at the ballot? And, just WHO voted? How were voters recruited? Yeah, okay, really, I don't care about the last two questions. Two material cards and a printing plate! Add to that the fact they were sent in screw-downs! That is fantastic. Randy Winn jersey A&G card, Baldelli jersey card, and Santos yellow printing plate. 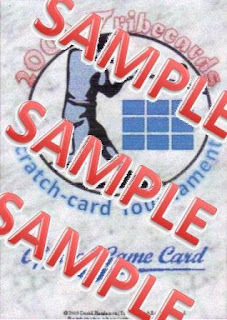 You can be sure you will see these again when the next scratch-off tourney rolls around! Just a quick note to let you know I have updated the lists of cards I don't have and the list of cards I do have. I'll warn you now: I am a moron who can't remember how I generated my "Owned" list to get the format it used to have. So, if you venture to the Owned list, it is even longer than before and not just because I've added cards! Speaking of the lists, if you've looked over them before, you may notice additional items that weren't in there before. That's because I have clicked the old 'want' box in the program for some more of the sets listed in the database. For the record, I am also too dumb to figure out how to get the program to kick out a TOTAL of wanted cards. Go figure. It will, however, tell me that my current collection is up to 7,950 cards. I want to thank EVERYONE that has helped me take my collection and nearly double it over the past year or so! A very nice hand-written note in crayon (my personal favorite medium!) with LOTS of Indians stickers on it! This was great! A note AND cards! Inside, I found Peralta, Byrd, Borowski, Pronk, Martinez, and others! 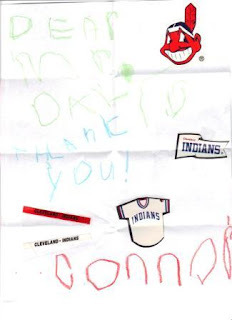 The last few items were an Upper Deck X die cut Sizemore, an Indians tattoo, and a Kobayashi AUTO card! Holy flippin cow! That means a lot to get these kinds of items from a fellow Indians collector! Hey! 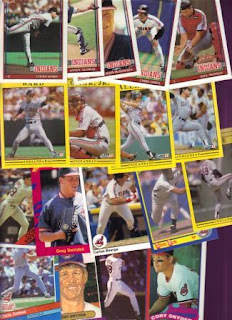 As I was posting this, I realized there was a Looney Tunes card stuck to the back of the Jack Morris card! It's a Road Runner at the plate card. LO<, I sent out several like it in the trick-or-treat giveaway... Nice work! Thank YOU so much, Connor and JV! This made a long day fade into memory. As promised, I am going to ask you the same trivia questions that appear in the book my son bought for me, "The MLB Best 50." Can you correctly match the player with the number of home runs he hit in 2007? The winner will choose ONE prize from the following: 2007 Topps Draft Picks and Prospects Football Chris Davis Senior Standouts Jersey Card; 2008-09 Bowman Draft Picks & Stars Basketball Dwayne Wade Relic Card (game-used material); 2008-09 UD Masterpieces Hockey Wayne Gretzky; OR 2008 Topps Baseball Series 2 Game-Used Uniform Relic Tony Pena. Today's mail brought with it a couple of VERY nice surprises from Kevin in Washington State!! I had sent him a trick-or-treat box and he wanted to send me something in return. I had no idea I would be getting two very cool, very vintage Indians! 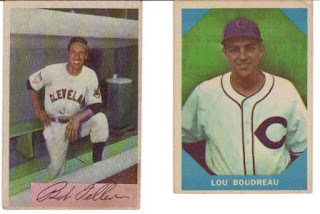 In the envelope was a 1954 Bob Feller Bowman Color and a 1960 Fleer Greats Lou Boudreau. Feller poses with a big grin and everything in the dugout while Boudreau sports a more casual grin out on the field. 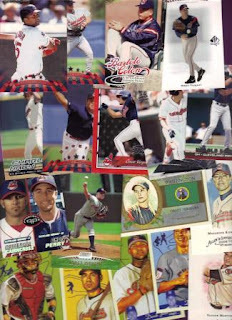 The back of Feller's card starts with this sentence: "Fireballing Bob has written so many records into the book that he will never be forgotten." Given he just celebrated his 90th birthday with great fanfare, I'd say that 54-year old statement rings true as ever. Boudreau's card extols the greatness of Lou: "Lou led the league in doubles three times, was batting champion in 1944 and paced all shortstops in fielding through seven seasons..." It goes on for three more sentences. Thank you very much, Kevin, for these GREAT vintage cards! And for those interested, these puppies are in SUPER condition - great corners, slight off-centering, backs are fantastic. Man, this was a super surprise and a wonderful way to end the work week! 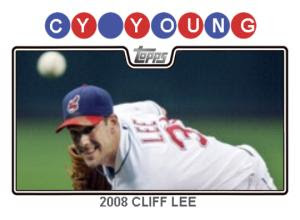 Cliff Lee was awarded the Al Cy Young yesterday! Awesome stuff happening for the Tribe as of late. 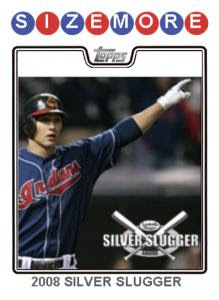 Grady Sizemore was awarded Silver Slugger 2008 by American League coaches and managers. 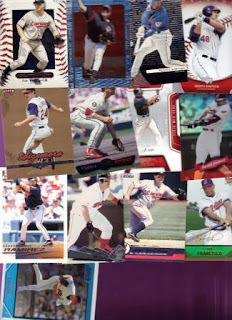 He's in very good Tribe company, as Victor Martinez, Juan Gonzalez, and Jim Thome have also won the award as Indians! A-Rod #1 top 50 player? And a prize! As I mentioned before, Costanza's Brother wins a prize for being the first to name A-Rod as the player associated with the "Factoid." His prize? 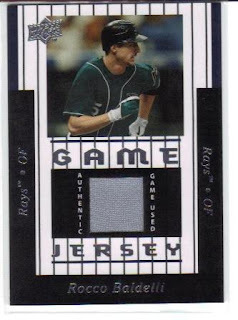 A 2008 Upper Deck Series 1 Game-Used Jersey Rocco Baldelli card! CB, drop me an email and I'll get your prize out to you! The "Best 50" book also has trivia questions in it, so at random times, I will post trivia questions for more prizes! This Year in Baseball Awards - Go Tribe! Forget election coverage - I got cards!